This whole victims and nemeses thing is entertaining up to a point, but the most interesting about it is that it sometimes leads me to comparisons and graphs that I wouldn’t have thought of looking at otherwise. That’s what happened when I sat down today intending to dash off something quick about Kris Freeman’s victims and nemeses. You can click through the links above for a refresher on victims and nemeses. Basically, I’m just counting up the number of times you beat (or are beaten by) someone by less than 10 seconds. Instances where this happens in “big” races like Olympics and WSC’s are given more weight. Now, the whole concept of victims and nemeses doesn’t really have anything to do with how skiers actually match up against each other. It might on occasion, but it doesn’t have to. This is the difference in FIS points between the two skiers in distance events. As we might have suspected, Piller Cottrer has in general been the better skier. 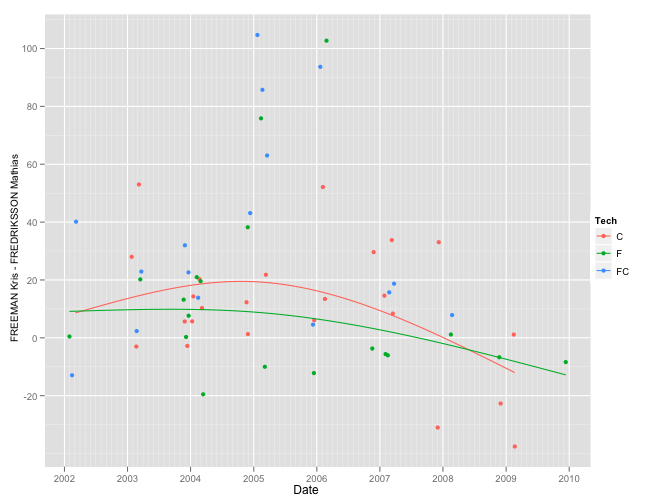 You can see all the dots near zero, though, that are responsible for his victim status relative to Freeman. Freeman has fared much better in classic races against Piller Cottrer, who is around five years older than Freeman so is probably pretty close to the end of his career. That would account for the general upswing in the trend lines over the past few seasons. One season that sticks out to me is 2003-2004, in which these two skiers were remarkably evenly matched. Sorry about reversing the order of the difference in FIS points. Below zero now indicates a victory for Freeman. Once again, Freeman looks to have had an better season in 2003-2004 (relative to Fredricksson) and has improved generally against him as Fredricksson has aged a bit. Jens Filbrich is an interesting victim as well. He’s about the same age as Freeman, so their careers largely overlap. Filbrich has been a successful but not dominant skier on the World Cup circuit. He’s had a bunch of excellent relay results with the strong German men’s team but only a handful of individual podiums. Recall that these guys are roughly the same age. 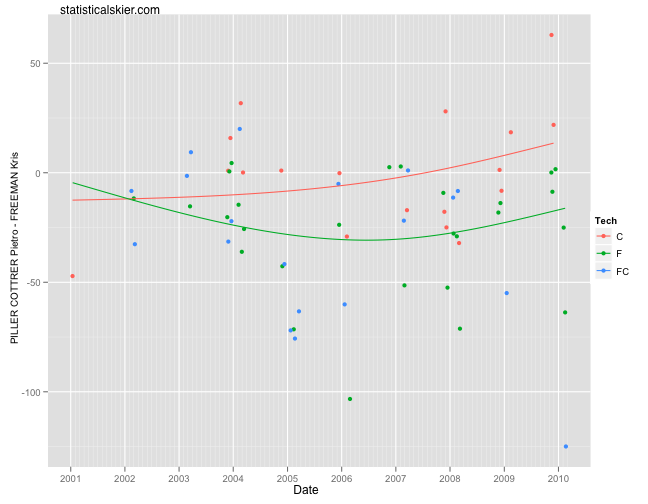 Filbrich cut his teeth on WC racing quite a bit earlier, but by 2001-2002 they were getting roughly equivalent results. Filbrich continued to improve and has consistently been able to record multiple sub-10 FIS point races since then. Freeman, on the other hand, seemed to struggle a bit after the 2003-2004 season before appearing to get on track again from 2007-2008 onward. Filbrich has clearly embraced the Tour de Ski stage race, while Freeman has chosen to focus on more traditional race formats. Two final things to note. 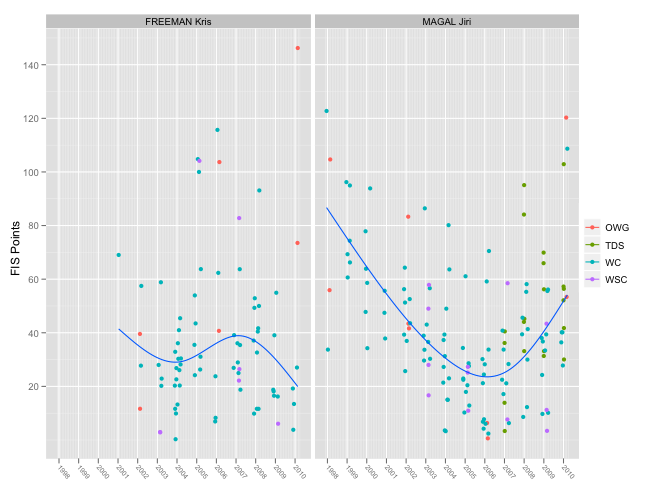 First, over the past five seasons at least half of Filbrich’s results are roughly on par with a typical race by Freeman (i.e. in the 20-60 FIS point range). Second, would anyone have guessed that after all the hand-wringing about Freeman’s performance at the Vancouver Olympics this winter that my trend line for him would end with a distinct downward flavor? His non-Olympic races were no different, or perhaps better, than the previous season. Now this is interesting. Freeman was faster than, or at least pretty even, with Magal up to the 2003-2004 season. Then clearly something changed, and the two were either finishing very close to each other, or Magal was crushing Freeman by a wide margin. 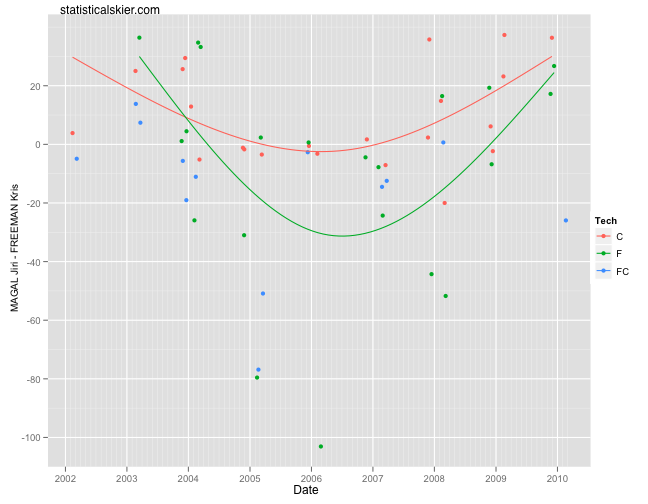 Then 2007-2008 rolls around and things start trending back Freeman’s way. What happened? What appears to have happened is that these two skiers had roughly inverse experiences between the 2004-2005 and 2006-2007 seasons. Freeman struggled relative to his other performances, while this same time period represented Magal’s peak. So the sudden change we saw in the head-to-head graph was a combination of Freeman having a sudden string of sub-par seasons combined with Magal continuing on his general development path. I don’t have any grand conclusions to go with all this. Like I said at the beginning, I just thought that the victims and nemeses idea led to some interesting comparisons. Posted by Joran on Monday, June 28, 2010, at 7:23 pm. Filed under Fun Stuff. Tagged Analysis, Distance, jiri magal, kris freeman, mathias fredricksson, nemeses, pietro piller cottrer, victims. Follow any responses to this post with its comments RSS feed. You can post a comment or trackback from your blog.